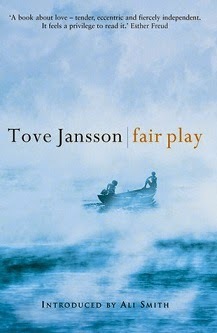 Tove Jansson’s Fair Play is structured much like her wonderful The Summer Book, and oh, it did things to my heart. I really like novels in stories, and Jansson does them better than anyone I can think of: she brings together a collection of small moments in such an accomplished way that they add up to something far larger than the sum of their parts. Fair Play is a wonderful love story about two women, Mari and Jonna, a writer and an artist who work and live side by side in studios on opposite ends of the same apartment building; and also a gentle meditation on careful and respectful intimacy and on the everyday reality of doing creative work. …in the end, a huge, yet astoundingly discreet, declaration of a good-working love, a homage to the kind of coupledom that rarely receives such homage, and at the same time a homage to the everyday weather, the light, the skies, the countless bad movies and good movies of living and working well with someone for the length of an adult life. I share this in part to make it clear that Mari and Jonna are not just friends: to frame their relationship as such is to contribute to the pattern of exclusion and erasure Smith alludes to. This being a Tove Jansson book, I’d now normally go on to praise the writing for its subtlety and grace — but in the case of Fair Play, I’ll have to ask you to bear with me as I try to sort through my thoughts on the politics of subtlety and my natural affinity for it. I want to clarify that I’m not praising Fair Play for being a quiet, subtle sort of novel because it depicts a lesbian relationship. I would guess that Jansson would write in this restrained way regardless because she does so about grandmothers and granddaughters in The Summer Book, and I love the careful and understated portrayal of important moments and meaningful connections between people she brings to both novels. Having said that, I’m fully aware that it’s different to say “I love how subtle it is” about the relationship between a grandmother and a granddaughter than it is to say the same about two women in a romantic relationship. And of course it’s tempting to take the context Jansson was writing in into account: would she be quite as subtle if she were writing now? Was an awareness that being discreet might be necessary for safety a force that shaped her writing? We have no real way of knowing. Mari was hardly listening. A daring thought was taking shape in her mind. She began to anticipate a solitude of her own, peaceful and full of possibility. She felt something close to exhilaration, of a kind that people can permit themselves when they are blessed with love. The book’s closing lines made my heart swell to three times its size. “The Letter” is probably my favourite story/chapter, mainly because of how well it captures the emotional landscape at the heart of Fair Play. The glimpses we get of Jonna and Mari’s lives depict a love solidly built on independence and complete mutual trust. This is a story about the joys of secure attachment, which is the same as what Ali Smith so aptly calls “good-working love”. Jonna and Mari’s solid companionship and lack of wearing mistrust free both women to work side by side; to give each other space; to pursue artistic possibilities and enjoy the solitude they both sometimes crave — and then to find their way back to each other when the time is right. It’s beautiful and moving and I want a thousand more stories like it. Fair Play is also very much a book about art and life; about the everyday reality of doing creative work. It examines not only the labour itself but the cyclical questions, the ups and downs, the struggles, the riding them out, and the coming back to the core reasons why you do what you do — all with the same wisdom and insight it brings to its portrayal of intimacy. The closing image of “Catfishing” is one that has stayed with me: there’s joy and meaning to be found in doing work you know well, work whose patterns are so ingrained in you they’ve become a source of comfort, and sometimes that’s all the justification you need. Beautiful review, Ana. I definitely want to read this book. I also have 'The Summer Book' on my 'TBR' list. I wanted to read that in August to celebrate Tove Jansson's centenary, but got distracted by life at that time. Hoping to read it in December. I love this sentence from your review - "The book’s closing lines made my heart swell to three times its size." :) I also loved the last two paragraphs of your review - so beautiful. Love the sound of this. I enjoyed the Winter Book, and adored the Summer Book, so this sounds like a must-read. Great review. What a beautiful review of what sounds like a truly beautiful story! "the core reasons why you do what you do," hmm. Maybe I need this book now, instead of trying to think up more justifications.